January 27, 2010 - Harrison Ford on Friday received the “Legends Aviation Legacy Award” at the 6th Annual Living Legends of Aviation Awards ceremonies at the Beverly Hilton for his continued work with the Young Eagles program, generosity and his love for aviation. The event is produced by the Kiddie Hawk Air Academy. The Kiddie Hawk Air Academy is a tax exempt organization incorporated and based in Colorado. The goal of the academy is to instill in kids from 4 to 9 years of age an interest and appreciation of aviation that will carry through into their adult years. A larger objective is to inspire interest and dedication to the academic excellence required to enter careers in aviation, science, commerce and related technologies. 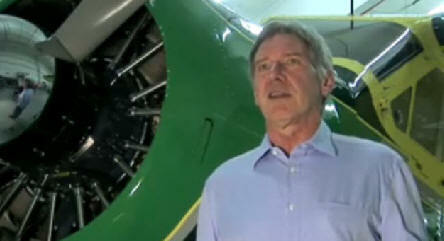 Harrison Ford an American film actor and producer is best known for his performances as Han Solo in the original Star Wars trilogy and as the title character of the Indiana Jones film series. He is also known for his roles as Rick Deckard in Blade Runner, John Book in Witness and Jack Ryan in Patriot Games and Clear and Present Danger. His four-decade career also includes roles in several other Hollywood blockbusters, including Apocalypse Now, Presumed Innocent, The Fugitive, Air Force One, and What Lies Beneath. At one point, three of the top four box-office hits of all time included one of his roles. Five of his films have been inducted into the National Film Registry. In 1997, Ford was ranked # 1 in Empire's "The Top 100 Movie Stars of All Time" list. As of July 2008, the United States domestic box office grosses of Ford's films total almost $3.4 billion, with worldwide grosses surpassing $6 billion, making Ford the third highest grossing U.S. domestic box-office star. Ford is also a private pilot began flight training in the 1960s at Wild Rose Airport in Wild Rose, Wisconsin, flying in a Piper PA-22 Tri-Pacer, but at $15 an hour he was unable to continue the training. His interest returned in the mid-1990s when he bought a used Gulfstream II and asked one of his pilots, Terry Bender, to give him flying lessons. Ford is a private pilot of both fixed-wing aircraft and helicopters, and owns an 800-acre ranch in Jackson, Wyoming, approximately half of which he has donated as a nature reserve. On several occasions, Ford has personally provided emergency helicopter services at the behest of local authorities, in one instance rescuing a hiker overcome by dehydration. Ford owns an flies a de Havilland Canada DHC-2 Beaver (N28S) more than any of his other aircraft, and although he dislikes showing favoritism, he has repeatedly stated that he likes this aircraft and the sound of its Pratt & Whitney R-985 radial engine. In March 2004, Ford officially became chairman of the Young Eagles program of the Experimental Aircraft Association (EAA). Ford was asked to take the position by Greg Anderson, Senior Vice President of the EAA at the time, to replace General Charles "Chuck" Yeager who was vacating the post that he had held for many years. Ford at first was hesitant, but later accepted the offer and has made appearances with the Young Eagles at the EAA AirVenture Oshkosh gathering at Oshkosh, Wisconsin for two years. In July 2005 at the gathering in Oshkosh Ford agreed to accept the position for another two years. Ford has flown over 280 children as part of the Young Eagles program, usually in his DHC-2 Beaver, which can seat the actor and five children. Ford is involved with the EAA chapter in Driggs, Idaho, just over the mountains from Jackson, Wyoming.